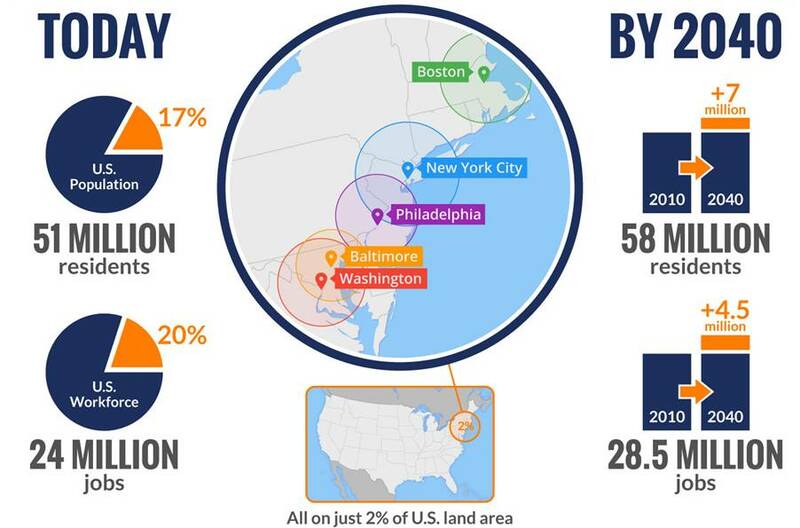 The Northeast Corridor is home to 17% of the US population and 20% of US jobs—all on a land area that represents just 2% of the United States. Travel between the major cities of the Northeast Corridor is predicted to increase by 115% by 2040. If we do not bring advanced transportation technology and new ways of thinking about transportation to the corridor, delays will only become worse. According to a study performed by INRIX in 2017, traffic congestion costs the average commuter in the Washington, DC area $2,060 per year and costs the area $6.3 billion per year. The average commuter in the Washington, DC area spends 63 hours per year sitting in traffic! 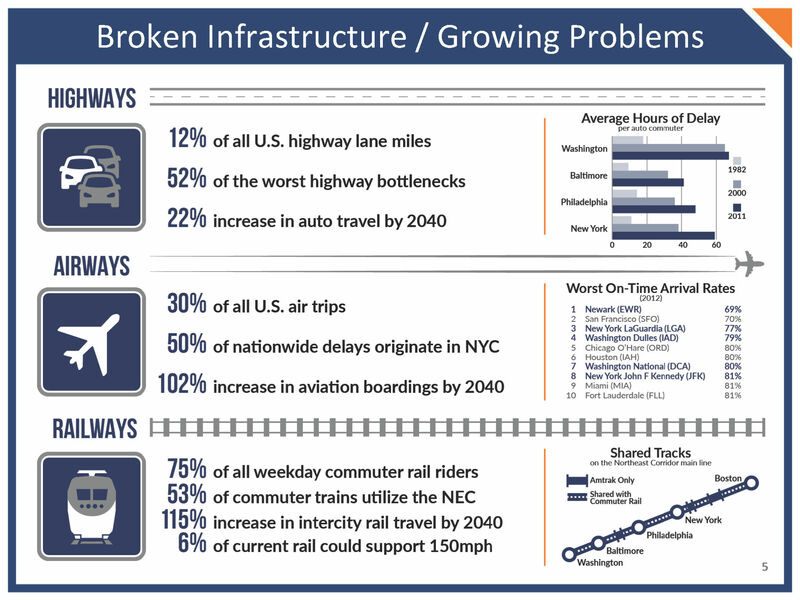 Amtrak’s 2012 Vision for the Northeast Corridor indicates that the Northeast Corridor is home to 52% of the United States’ worst highway bottlenecks. The study predicts a 22% increase in auto travel by 2040 and a 200% increase in delays over the next 30 years. According to the Federal Railroad Administration’s (FRA) comprehensive plan for improving the Northeast Corridor (NEC FUTURE), half of all national airline delays and 30% of all US airline trips originate in the NEC. The plan projects a 102% increase in airline passengers by 2040. 75% of all US weekday rail commuters ride on the NEC. Yet, the current rail infrastructure in the Northeast Corridor is over 100 years old. It wasn’t designed, nor is it suitable for true high speed transportation. The infrastructure is shared by 9 passenger and 4 freight railroads. As the rails are shared, all trains are limited in speed by the slowest trains on the network. That is, a high speed Acela train can only go as fast as the slow freight train ahead of it. As a result, the NEC’s current high speed train, Acela, can only average 85 miles per hour. In its current state, only 6% of the NEC’s rail infrastructure could support speeds of 150mph. In 1998 the Maglev Deployment Program (MDP) was established in the US Transportation Equity Act for the 21st Century (TEA-21) with the purpose of demonstrating the feasibility of Maglev technology to provide a safe, efficient transportation option in the US. The Federal Railroad Administration (FRA) published a Programmatic Environmental Impact Statement (PEIS) for the MDP in 2001. Through a nationwide competition, FRA selected seven states, from a pool of eleven, to receive grants for pre-construction planning. The Baltimore to Washington (Maryland) and Pittsburgh (Pennsylvania) projects were selected for continued evaluation and initial project development. In 2003, FRA, in cooperation with the Maryland Transit Administration (MTA) prepared a Draft Environmental Impact Study (DEIS) on a proposal to build a Maglev project linking downtown Baltimore to BWI Marshall Airport and Union Station in Washington, DC. German maglev technology, Transrapid, was selected for the project. An EIS was prepared, but Maryland suspended the project and a final EIS was never issued. The current project proposes to utilize the Japanese SCMAGLEV system, whereas the 2003 DEIS proposed the German Transrapid system (learn more about SCMAGLEV technology). In addition, Baltimore-Washington Rapid Rail (BWRR), the project sponsor for the current project, is a private entity and is contributing funds to the current EIS study. In March 2015, the Federal Railroad Administration (FRA) issued notice of available funding under the Maglev Deployment Program (MDP). In April 2015, acting on behalf of Baltimore-Washington Rapid Rail (BWRR), Maryland Department of Transportation (MDOT) submitted an application to FRA for the funds to perform preliminary engineering (PE) and National Environmental Policy Act (NEPA) work related to BWRR’s SCMAGLEV proposal. In 2015 Baltimore-Washington Rapid Rail (BWRR) announced that the Maryland Public Service Commission (PSC) approved BWRR’s application to acquire a passenger railroad franchise previously held by the Washington, Baltimore and Annapolis Electric Railroad Company. The railroad franchise was abandoned in 1935, with approval of the PSC. In 2016, FRA awarded $27.8 million to MDOT to prepare preliminary engineering and NEPA analysis for an SCMAGLEV train between Baltimore, MD, and Washington, DC. Baltimore-Washington Rapid Rail is providing preliminary engineering and technical assistance as well as additional funding support, in concert with the FRA grant, for the NEPA process. Currently, The Federal Railroad Administration (FRA) and the Maryland Department of Transportation-Maryland Transit Administration (MDOT-MTA) are preparing an Environmental Impact Statement (EIS) to evaluate the potential impacts of constructing and operating a high-speed superconducting magnetic levitation (SCMAGLEV) system between Washington, DC and Baltimore, Maryland with an intermediate stop at BWI Airport. *All claims and descriptions of the SCMAGLEV system and operations, are based on current plans and are subject to change as the project moves forward. Photos of the Series L0 trains used on this website are all used under permission from Central Japan Railway Company (JR-Central). JR-Central will not be the operating entity of the SCMAGLEV in the US Northeast Corridor. Some promotional material and information prepared by and used with the permission of Baltimore-Washington Rapid Rail. Be a part of the future! Sign up and receive updates and information about the Northeast Maglev. Imagine the possibilities. Which benefits are you interested in? * By signing up, you are agreeing to receive updates and information from the Northeast Maglev. We will not rent, sell, share, or disclose your information to outside parties. You may opt out at any time.